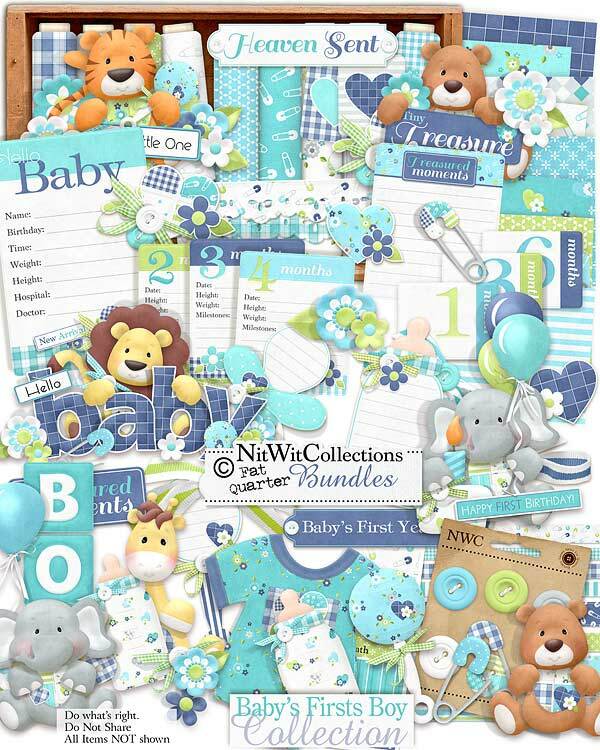 FQB "Baby's Firsts Boy" Collection is the perfect digital scrapbooking and card making kit to track your baby's first year from birth up to and including his first birthday! The sweet colours of this digital kit will give you bright and colourful scrapbook layouts, cards and mini albums and the characters, announcements for each month and other embellishments provide the inspiration and creative ease. 1 Baby elephant ready to trumpet his arrival! 2 Heart stickers with flowers in the lighter and darker blues....which do you prefer? 1 Onesie - will remain clean and unstained and he'll never grow out of it! 1 Baby rattle in the blue of this digital kit...but a quiet rattle...maybe just what you'll need!